I am attempting to reset my internal clock. Emphasis on attempting. This battle of early birds versus night owls has been active in our home for years. Articles on the needs and the benefits of following your natural sleep rhythm are all wonderful and lovely. Finally! Justified in our need to sleep in and stay up late! Well, unless you live in the real world. The real world where husbands have to leave for work at 5:30 am, where toddlers and preschoolers love nothing more than early morning cuddles, and where colleges have classes before lunch. So I am trying to embrace the realities of life instead of fighting them to the death. It is going really well. This morning when I heard my husband getting ready for work, I jumped out of bed and rushed to the kitchen to pack his lunch for him and chat a few minutes before he left. Fabulous, yes? Wife of the Year? Oh, I think so. It was a dream. No. joke. I heard his alarm. I heard him walk out of the bedroom. Then the wonders of the human brain and the sleep cycle decided to have a little fun. When I finally was awake enough to have a coherent thought, it dawned on me that it was all a dream. An hour to two had passed since he left. So much for that Wife of the Year award. Realizing my missed opportunity I naturally jumped out of bed and charged into the morning. Or not. I might have cuddled under the blankets with a really cute toddler and an adorable, cuddly preschooler and did a bit of Bible reading. Then a couple more kiddos might have come to share the covers and slowly acknowledge the beginning of a new day. Motivation to exercise had to be uncovered. A chat here and there with an older kiddo or two. So the battle continues. Tomorrow. The Night Owl who is trying really hard to reform and become an Early Bird. It was not that long ago that I enjoyed reading Raising Real Men by Hal and Melanie Young. As a mom of two boys, the practical, real-life experiences and advice shared by the Youngs was a great encouragement. 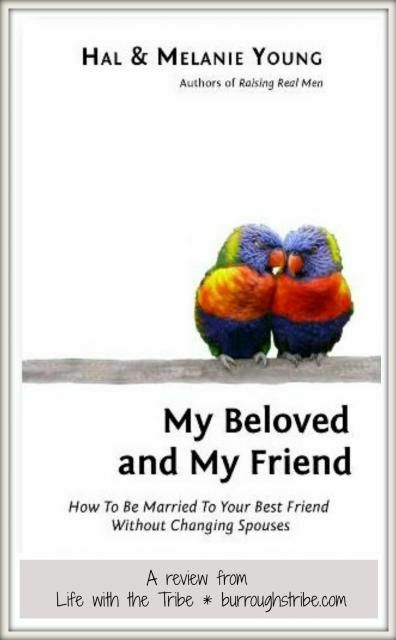 When I was offered the opportunity to read a pre-publication copy of the Youngs’ newest book, My Beloved and My Friend – How to be Married to your Best Friend Without Changing Spouses I did not hesitate. You can stop by My Beloved and My Friend.com to learn more. 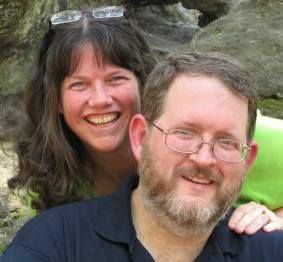 Hal and Melanie Young have been married for over thirty years. Through those years they have experienced major moves, job loss, high-risk pregnancies, life-threatening illnesses and the list could go on. Hal Young’s battle with stage IV cancer caused them to reflect on thoughts of marriage that they desired to share with their children. The result was My Beloved and My Friend. Not only do they share the struggles and hard times, but the resulting beauty and joy of a marriage to your dearest friend. My Beloved and My Friend, unlike other books on marriage I have read, do not divide the married couple into man vs. woman. There isn’t any chapter on what the woman needs and what the man needs. There is no list of the Top 25 Things to Say to Make Your Man Feel Appreciated or a section devoted to understanding Why Your Wife Needs to Cry. While these may be valid points to discuss, they often hinder the true discussion that needs to happen. Hal and Melanie Young begin by building a foundation of oneness. The first section is on Leaving and Cleaving; that beautiful but sometimes challenging transition from two separate people into one flesh. That state of being one flesh is the foundation for a biblical outlook on marriage. If you are one flesh, how does that play out when someone is sick, when your spouse really loves football, or the dishes are overflowing in the sink? The Youngs do a fabulous job of presenting biblical, scripture rich advice and experience on marriage that makes you feel like you are chatting with an old friend. While conversational in tone, the Youngs do not avoid difficult topics in My Beloved. Even when you disagree with their stance, you can trust that they diligently searched the Word. It is Not Good for the Man to be Alone addresses: Leaving and Cleaving and How to be Married to Your Best Friend. A Helper Suitable for Him looks at: In Sickness and in Health, On Submission, and Fidelity and Loyalty are not Mutual Funds. Each topic/chapter can stand alone. Perhaps you are struggling in one area of your marriage. Maybe finances or family size is a major cause of stress in your marriage relationship. You can begin reading those chapters and pick up earlier chapters later. While each chapter compliments others, it can be helpful and encouraging to refresh yourself in certain areas. 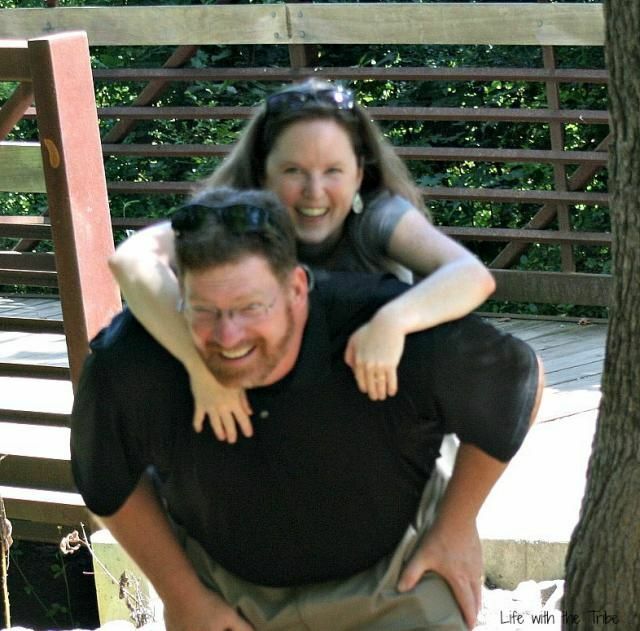 For the past seventeen years, I have been blessed to not only be married to a wonderful man but to also call him my dearest friend. We have shared in life’s up and downs: job loss, death of a child, and financial strain. Despite all those challenges, we have had joy and laughter in the midst of it all. I am so thankful that before we were married, we were friends. It became a beautiful foundation for marriage. Even more beautiful is that even if you did not marry your best friend, God can work in amazing ways. No matter how long you have been married, no matter the struggle you may be facing as a couple, He can bring you closer. He can make you the best of friends. My Beloved and My Friend can be a source of help and encouragement as you seek that closeness. This would be a great resource for couples who are engaged to be married or recently married as well. My Beloved and My Friend: How to be Married to Your Best Friend Without Changing Spouses is currently available for pre-order. February 14, 2014 is the scheduled release date. You can pre-order a copy for $12.00 (free shipping). Stay updated at My Beloved and My Friend.com. "Long before thinking of diamonds & glitter, here are some things that I need to consider." 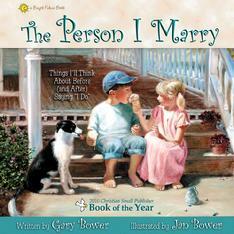 Bower Family Books has a charming book available titled The Person I Marry. Gary Bower in poetic form shares the characteristics/qualities one should desire in a future spouse. Respect, kindness, honesty and thoughtfulness are just a few of the qualities discussed in this book. Jan Bower, Gary’s wife, enhances the text of this book with beautiful oil painting illustrations. While at first glance, The Person I Marry may appear to be a children’s book, it can be enjoyed and beneficial to more mature readers. It is an excellent tool to use with young and older children about marriage, praying for their spouse and exactly what qualities they should desire to see in themselves and their spouses. This book would also be a delightful gift for a new couple that would benefit from the reminders and encouragement found inside. The Person I Marry from Bower Books on Vimeo. I shared this book with my children. They enjoyed the poetic form and delighted in the oil paintings. It will be interesting to share this book with them over time and see how the discussion changes about future spouses. I think the Bowers did a lovely job covering such a wide range of qualities. I appreciate that it made a point to speak of God being before you or your spouse. It also referenced those who may not marry which is an excellent point to chat about with your children. The Person I Marry is a 32 page hardcover book. It can be purchased from Bower Books for $11.99. The Person I Marry is only one book in the Bright Future Series. Take a moment to look around! You might find that perfect gift. Other Crew members read The Person I Marry. Please stop by and see what others thought of The Person I Marry. Disclaimer: As a member of TOS Review Crew, I received a complimentary copy of this product for review. No compensation was made. The thoughts/opinions expressed in this post are my own.